Falling in love….that is how I felt when I first saw glass-on-glass mosaic in the western window of Bedrock in Seattle. The light! The color! It took my breath away. I have been called an old soul, which is why I love mosaic. Mosaic bridges the ancient and modern worlds, in all its elements: inspiration, design, materials. Mosaic is design, and it is work. Mosaic is spiritual, yet absolutely physical. Mosaic blends soft beauty and hard-edged tesserae. 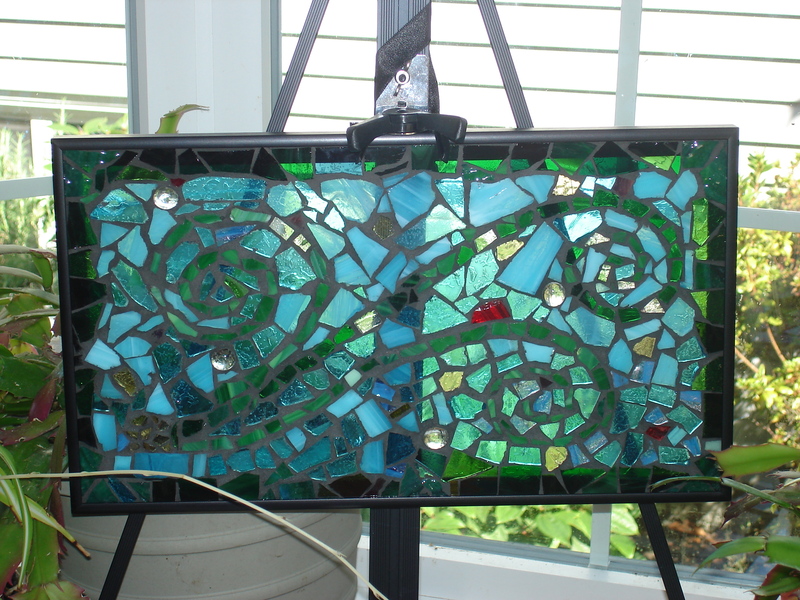 Mosaic births something new out of brokenness. In the past year, I’ve been experimenting more with sewing. My mom is a fine seamstress, but I only recently really started getting into this. I’ve made a lot of my own clothes, and in the summer of 2018, I made my first quilt, a king-sized creation fully designed, pieced, and quilted by me–on a small domestic machine. In bringing any creative work from dream to concrete reality, I thrive on the interplay of problem-solving brain, working with one’s hands, and honoring the unique tools of the trade. I sense the legacy of my family — a quiltmaker, a steelworker, farmers – people who worked with tools to create durable, useful, and beautiful items for their communities. In all of this, I follow my instincts and preferences to explore my emerging creative voice. Deb – your work is beautiful! I can’t wait to come to a show! !